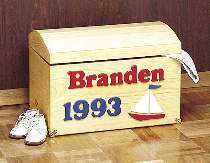 Children love these chests for toys. Also ideal for adults to save their children's memorabilia such as their baby book, photographs, school report cards. Plan includes patters for numbers and alphabet, as well as sailboat and bow. Fits names up to nine letters. Measures 18"W x 12"H x 12"D. Hope Chest Hardware includes two lid supports, four case corners and one pair of hinges. Project plan, wood and wood finish are not included.